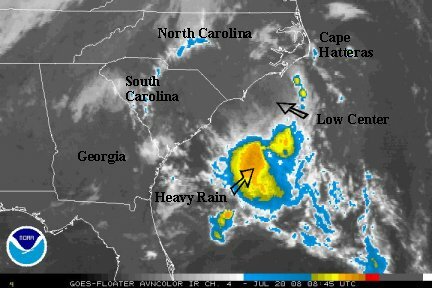 A tropical depression is forming off of the Georgia coast. Forecast models take this system slowly along the coasts of the Carolinas the next couple of days. Heavy rain and squally weather is possible as well as rough surf. Complete updates will resume Saturday evening. Christobal briefly popped its center of circulation out a few hours ago on the visible satellite imagery. The radar and satellite show the heaviest rain on the east side of the circulation. There is a very heavy thin band of rain just north of Wilmington. Three to five inches of rain is possible over where the band is stationary. Top sustained winds are around 45 mph and it is moving northeast just off of the South Carolina coast southeast of Myrtle beach by about 75 miles. Forecast models take Christobal close to the North Carolina coast Sunday, then accelerate it northeast off of the Nova Scotia coast by Tuesday. The main impact to the northeast coast looks to be rough surf. Rip currents will be stronger than normal. Heavy rain will also fall, especially on the North Carolina coast where five inches or more is possible in the bands. Last edited by Caribbean Traveler on Mon Jul 21, 2008 1:43 pm, edited 1 time in total. Christobal is looking sick this morning. 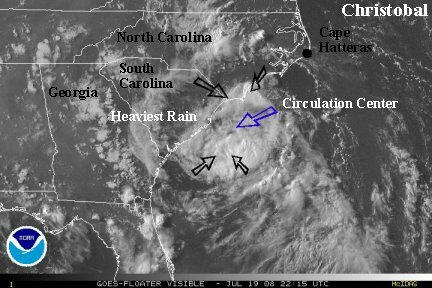 Deep convection is nearly absent from the circulation center which is about 50 miles east of Wilmington, NC. Christobal will parallel the North Carolina coast today with the center moving very near Cape Hatteras. With the deep convection removed from the center, this should not be a big concern. The biggest issue will be rough surf for the NC coast. The forecast models still take this system rapidly northeast, east of Nova Scotia by Tuesday. Christobal does not look like it will make much of an impact on the northeastern U.S.
NHC increased winds in Christobal up to 50 mph and says that it is strengthening. Please note - this is NOT representative of what is happening on the coast. The Hurricane Hunters found an isolated stronger gust east of the center. 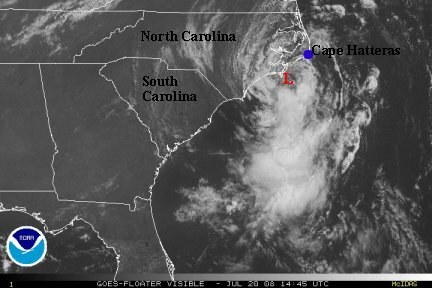 The circulation center which is only 30-40 miles east of cape Lookout is nearly void of heavy convection. The next update will be around mid-day. Christobal is still struggling. Despite NHC upgrading to a 50 mph tropical storm earlier today, we think Christobal is not as threatening as yesterday. 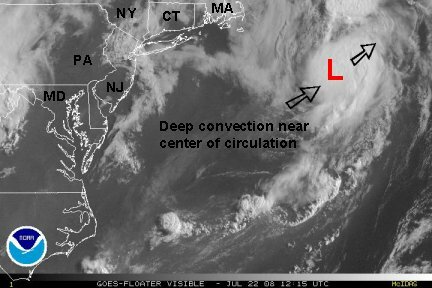 The main reason, is that the deep convection has been mostly stripped from the circulation center. The strongest winds are well offshore of the South Carolina coast. Still expect rip currents to be stronger than usual today on the North Carolina coast. Otherwise, occasional showers or a heavier shower if a band develops. Forecasts continue to move Christobal along or barely offshore of the North Carolina coast today and move northeast more rapidly to near Nova Scotia by Tuesday. The northeastern U.S. will probably see little effects other than slightly higher swell and maybe a shower on Cape Cod. Last edited by Caribbean Traveler on Mon Jul 21, 2008 1:44 pm, edited 1 time in total. 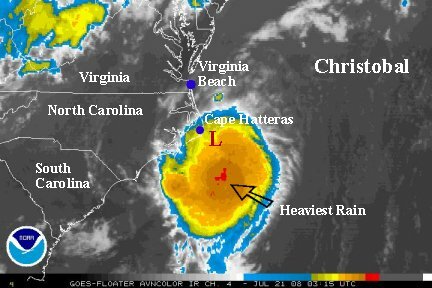 Christobal has fought off some of the dry air and now actually is strengthening some so that it looks like a bona fide tropical storm. The center of circulation is clearly seen on radar about 50 miles east of Cape Lookout. It will continue moving northeast paralleling the North Carolina coast tonight with some gain in strength possible. The main effects will be a slight increase in tides. 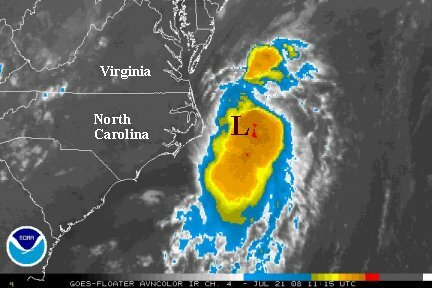 Some heavy rain may try to develop on the Outer Banks if it can rotate around the center. 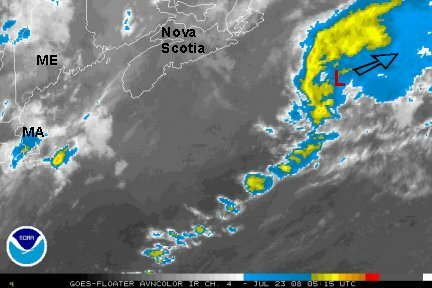 The forecast is nearly unchanged with it accelerating northeast and heading to or offshore of Nova Scotia by later Tuesday. Last edited by Caribbean Traveler on Mon Jul 21, 2008 1:45 pm, edited 1 time in total. 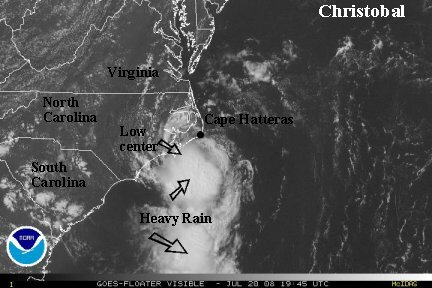 Christobal is now just east of Cape Hatteras with the heaviest rain remaining off of the coast of North Carolina. 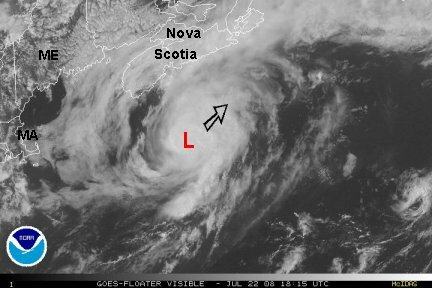 It will accelerate northeast toward Nova Scotia or just east of there. Slightly higher than average swell will be seen on the northeast coast as Christobal passes during Monday and Tuesday. 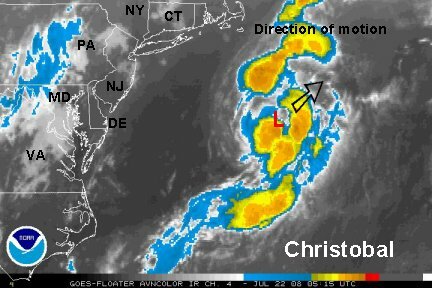 Christobal from overnight has not changed appreciably. Deep convection still remains on the southwest quadrant. NHC's top sustained winds of 50 mph looks a little high now. Top sustained winds are probable 40-45 mph per the last recon. Seas are generally about 5 feet off of the North Carolina to Virginia coast, but one buoy measured 10 feet well offshore. Look for the seas to calm down as Christobal moves away. The forecast track has shifted somewhat southeast, so that if Christobal stays father offshore, it may extend its life. Instead of making landfall in Nova Scotia, it may pass just to the south and hamper the shipping lanes longer. The northeast U.S. will not see very many effects except for slightly higher than normal swell. Last edited by Caribbean Traveler on Mon Jul 21, 2008 1:46 pm, edited 1 time in total. Christobal is likely a minimal tropical storm at this point. Microwave estimates are all near 40 mph at this time. NHC has Christobal at 65 mph per the last advisory. We're not sure why so strong. The last recon had a flight level wind gust to 43 knots. Surface winds would be less than that. 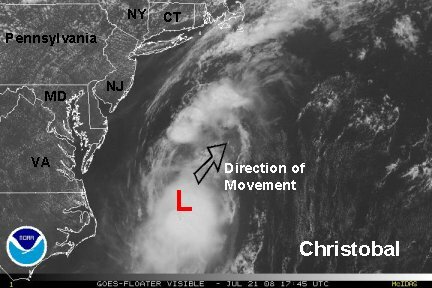 Anyhow, Christobal is moving northeast and will probably stay at tropical storm status over the Gulf stream as it heads south of Nova Scotia in the next couple of days. There will be minimal effects to the northeast U.S.
Christobal is continuing northeast along the Mid-Atlantic coast today. It will pose very little threat to the northeastern U.S.
NHC continues to hold the top sustained winds at 65 mph, and we are still baffled by this. A recent recon estimated surface winds of 32 knots with 45 knots in a squall band. Also, microwave satellite estimates are only near 40-45 mph. Our estimate is that Christobal is probably near 45 mph. The latest satellite imagery is showing heavy convection rebuilding over the center of circulation. If this continues, and Christobal strengthens, it may be close to 65 mph by later this evening. An interesting note on the forecast track. Models are now hinting that Christobal may recurve south in about three or four days from now well south of Newfoundland. This would be in response to a high center drifting west. If this does occur, Christobal may be around for awhile. Christobal is moving out and is off of the Delaware coast. NHC still has top sustained winds too high at 60 mph. Our estimate is 45-50 mph, with a stronger gust possibly in a storm. Sustained winds of 60 mph should produce gusts to 70 mph or more and that is simple not the case here. Christobal will rapidly move off of the Northeast coast today and south of Nova Scotia. If it holds together and is not sheared apart it may try to drift a little south of Newfoundland in 2-3 days as a weak low. Christobal is about 400 miles east of Long Island, NY this morning. The satellite presentation looks as well organized as it ever has for this tropical cyclone. NHC is still going with top sustained winds of 60 mph still. Even though it has strengthened, we we going to estimate 55 mph. Seas are in the range of 6-12 feet well offshore of the Northeastern U.S. Seas are considerably lower on the coast. The forecast is still relatively unchanged. Rapid motion to the northeast in excess of 20 mph, then more easterly around a high pressure system. Christobal will gradually lose tropical charateristics over the next few days. It if does move over colder water, that will occur more rapidly. It if stays a little more south, then it will hold on longer. 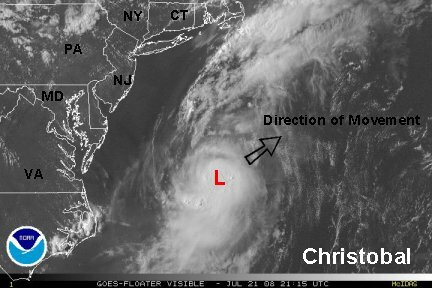 Christobal still looks to be a probelm with high seas in the northern north Atlantic, but nothing that unusual for that part of the world. Seas 10-15 feet are not unusual off of Newfoundland. Christobal continues to rapidly move northeast, now south of Nova Scotia. It will lose tropical characteristics over the next couple of days in the northern north Atlantic. Christobal is only a concern to shipping.